Introduction: Earlier this year, we had the opportunity to take a detailed look inside Daiwa's new Steez A TW 1016 casting reel - an aluminum version of their flagship Steez baitcasting reel outfitted with their t-wing line guide system. It impressed us in the lab but how did it do out on the water in the real world? Let's find out. 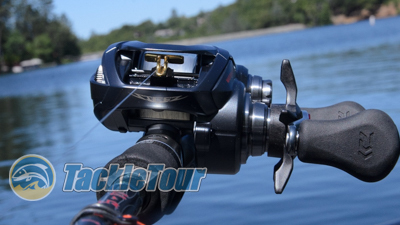 Here now is our full review of Daiwa's Steez Z TW 1016 casting reel. 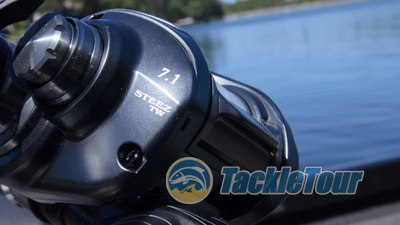 The Steez A TW is the latest flagship variant from Daiwa. Impressions: As covered in our First Look Article published in May, the Steez A TW 1016 is an aluminum framed version of the Steez (traditionally a magnesium framed reel) outfitted with the T-Wing line guide. It features a kind of stealth bomber grey paint that gives the reel a very high end look. 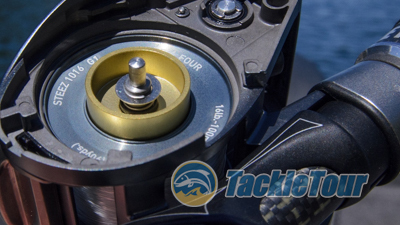 It's design intent is really for inshore fisherman more so than bass fisherman and as such comes with a standard Mag Z deep spool rather than the newer technology and more bass application friendly SV spool. It's available in two retrieve ratios. We tested the 7.1:1. As such, there are plastic bushings under each knob rather than bearings, but honestly, these are very easy items to upgrade at minimal cost if you choose to do so. Bearing size for the handle knobs is 4x7x2.5 and they don't have to be high quality bearings since the spin speed of your handle knobs is negligible. However, corrosion resistant bearings is probably a good idea. Seeing the TWS lineguide on the Steez platform takes some getting used to. Real World Tests: For the Steez Z TW 1016's real world tests, I spooled it up with some general purpose Sunline Sniper fluorocarbon in sixteen pound (16lb) test and mounted it on my Gancraft KG-00 5.5-670EXH Ground Trick - a stick with a lure rating of three quarters to three full ounces (3/4-3oz) yet only six feet seven inches (6'-7") in length. Mounted on a Gancraft Ground Trick and ready for some action. Casting: Having reviewed countless Daiwa casting reels in the past, we're already familiar with the limitations of the MagForce Z braking system with regards to lighter lures (it's best with lure weights from 3/8 oz and up). In addition, it's quite obvious the Steez Z TW 1016 is designed as a general purpose reel rather than finesse, so we didn't bother testing the reel's low range limit. The Steez A TW features a 20 point dial for the MagForce Z brake force adjustment. 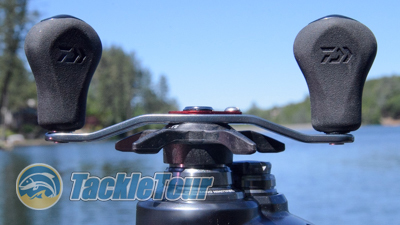 We paired it with the Ground Trick to evaluate the reel's performance with distance, effectiveness of the brakes, and ease of casting with a variety of standard application lures including spinnerbaits, cranks, and some big baits. A look at the standard, MagForce Z rotor. What we found, of course, was the reel performed very well and as expected. 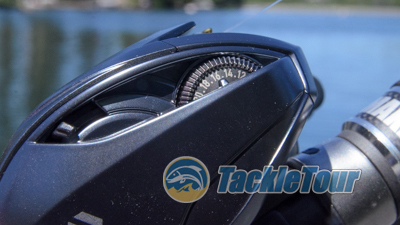 Daiwa's T-Wing line guide system really does give each reel upon which it is implemented a very easy, frictionless casting feel that's difficult to explain unless you're accustomed to casting open face reels without a line guide. This advantage is especially notable with baits over one ounce as the added momentum from the heavier baits can make some reel scream a little as the line comes off the spool. The Steez TW 1016, however, is perfectly quiet and content when launching lures at any weight range. 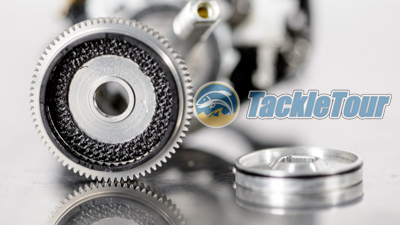 The reel's handle measures 90mm in length. 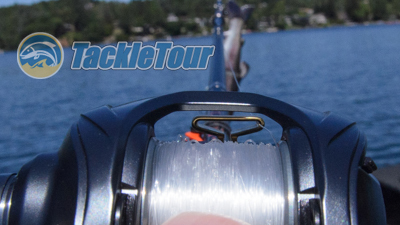 Retrieve: Click that handle over, re-engage the gearing and what you notice almost immediately is how stout and rigid this reel is thanks to its aluminum frame. This sensation probably has more to do with the lack of that sometimes hollow feel you get from magnesium framed reels and almost always get with composite framed reels. There's just no beating the confidence inspiring feeling you get from using a reel built out of metal and the Steez A TW 1016 is very confidence inspiring. The Duralumin gear of the Steez A TW. Power: Daiwa uses a standard sized, Duralumin (aluminum composite) main gear in the guts of the Steez A TW 1016 and the power generated from this gearing is sufficient to pull deep diving cranks like the Norman D22 or Strike King 10XD through the water, but it's not a reel I'd dedicate for deep cranking. Granted, we tested the 7.1:1 reel, so perhaps the slower retrieve version would work better. 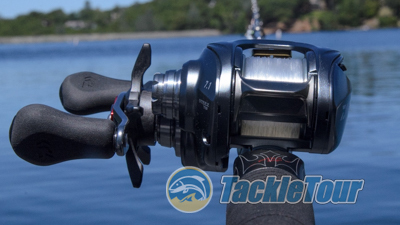 Again, the reel can handle those duties, it's just that there are better choices if you're looking for a deep cranking reel. Otherwise, this reel can handle other applications just fine. 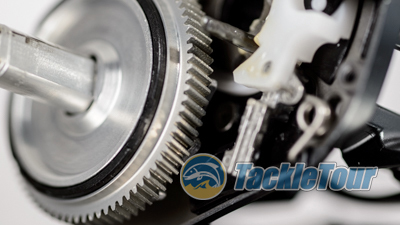 The reel's drag stack is a departure from past Steez reels. Next Section: A drag worthy of a Steez?